Born and raised in Victoria, Geoff Hobson has been fishing British Columbia waters for the majority of his life. With years of fishing Victoria's waterfront for salmon and halibut, an urge for bigger and better sent him to the immense fishery of the Queen Charlotte Islands. 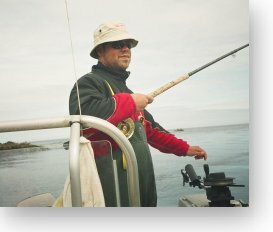 With British Columbia's vast fisheries in his "back yard", he has taken advantage of the fishing on the West Coast and made it a year round hobby. In addition of being a saltwater fishing guide, Geoff is also an avid fresh and saltwater flyfisherman taking him from the lakes of Victoria for trout and bass, to the Queen Charlottes open ocean, casting streamers to feisty coastal coho. Geoff is also a freelance outdoor writer and photographer based out of Victoria, with articles and photos in magazines such as Salmon Trout Steelheader, BC Outdoors and Island Fisherman to name a few.